Two exhibition teams from the newly formed National Dodgeball League (NDL) went head to head in a never before seen preview of the nations hottest new sport -- Dodgeball. 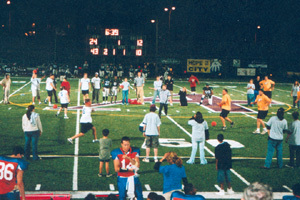 During half-time of the Minnesota Maulers football game, the Wisconsin Ions and the Minnesota Blur battled back and forth for twenty minutes. Minnesota jumped out to an early 4 game lead over Wisconsin. The Ions, however, rallied to bring it within one game with under four minutes to play. The Blur held strong and when the final whistle blew, they were on top 7 games to 3. Many of the fans on hand had never witnessed an actual dodgeball match before. "This was awesome. I just came to watch some football, but the dodgeball was cooler," said one fan. It didn't take long for the crowd to get into it. Every catch, hit, or acrobatic dodge was met with a roar of approval from the stands. Both the Ions and Blur currently field exhibition-only teams. Official tryouts for the first season will be held in September at the Dodgeball World Championship in Las Vegas, Nevada. Find more information the NDL's pro contact us here.